In this paper, we proposed a ceiling mobile robot which can transfer a heavy load. First of all, we explained the basic design to overcome the constraints of the motion flexibility and maximum payload, and proposed a ceiling mobile robot that hangs under a ceiling perforated plate with continuous hole patterns. Next we designed and implemented two key mechanisms for the proposed robot; (1) a hanging mechanism for the robust ceiling lock/release motion and (2) a pantograph mechanism for averaging the locomotion speed of the separated inner and outer bodies. 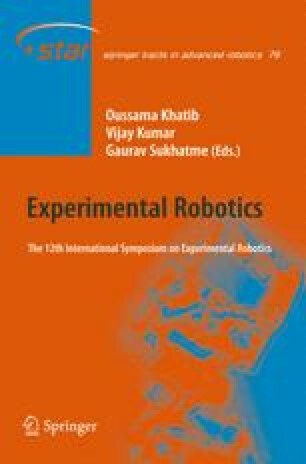 In the experiment, the capabilities of the developed two key mechanisms are evaluated and revealed that both mechanisms have enough performance to construct the proposed ceiling mobile robot. Moreover key points of the future works to utilize the developed mechanisms are also mentioned. That is, the optimization of the number and alignment of the hanging mechanisms.